In 1867 an old pear tree, planted 200 years earlier by a Dutch settler on a Manhattan street corner, met its demise. The tree had been decaying for some time but a collision between two carriages killed it with one blow. More than a few New Yorkers grieved. The loss of the tree became yet another reminder that vestiges of the nation’s Colonial Era were slipping away. 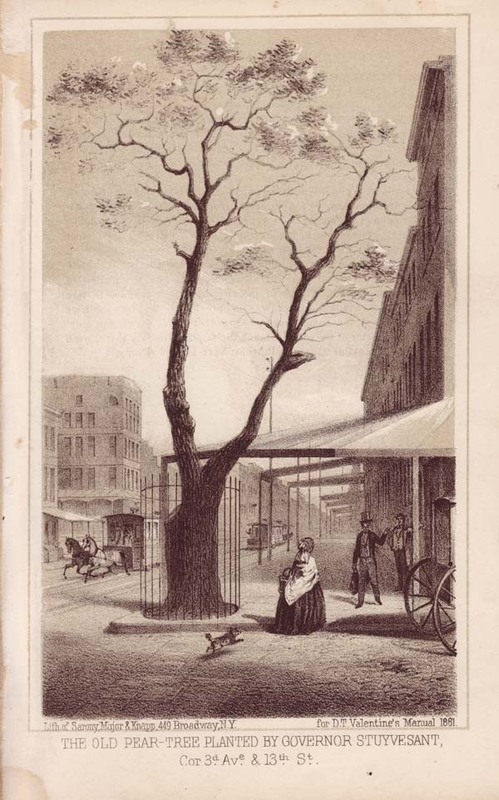 The most valuable image of the Stuyvesant tree, a lithograph, had been created for the 1861 edition of a long, boring book called the Manual of the Corporation for the City of New York. These manuals contained statistics, rules, minutes, and endless lists of city officials and buildings, livened slightly with maps and pictures. A clerk named Valentine published the books annually between 1842 and 1866. About 50 years after the last volume was issued, a Scottish immigrant, Henry Collins Brown, decided to revive the Valentine’s Manuals, as they were known. He would change the formula with lots of color illustrations and folklore. He thought he saw an opening: while guidebooks and memoirs of Old New York were readily available, few combined information with local history in an entertaining way. Between 1916 and 1928, Brown produced eight new manuals. Alas, while the New York Times took notice, the books did not sell. Brown's endeavor remains interesting for just one reason: The Prints. These were copperplate engravings and lithographs of the city dating back as far as two centuries. At the time of World War I, most of these “views” belonged to libraries and collectors. Brown scrambled, pleaded, and occasionally dissembled to gain permission to reproduce the images in his manuals. In order to copy the lithograph of the pear tree, for example, Brown had to beg the librarian of the New-York Historical Society, which owned the original. In the 1890s, a greater appreciation of American traditions, lore, and art emerged among the general public. 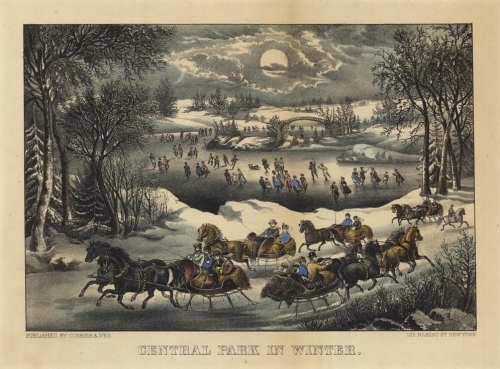 Some historians believe it originated at the 1876 Centennial Exposition in Philadelphia, where millions of Americans visited an old New England farmhouse and viewed American art and furnishings. The antiques business evolved quickly. Cabinetmakers who were experienced in fixing older pieces leaped to become dealers. And some of those dealers began to comb the New England countryside, knocking on the doors of farmhouses under false pretenses, hoping to be invited in, buying many a rare item for a song. Inevitably, the Americana obsession encompassed The Prints. The market became highly competitive. Among the most important collectors, the blue-blooded Isaac Newton Phelps Stokes occasionally bumped heads with Henry Collins Brown as the latter sought permission to use various images. Can there be anyone so callous, and so lacking in romance, as not to feel a thrill of emotion before such contemporary pictures as Paul Revere’s Landing of the British Troops at Boston in 1768, the inauguration of Washington in the loggia of the old Federal Hall, or the engagement between the Merrimac and the Monitor? Originally, the New York market for prints was centered in downtown Manhattan. The first print dealers were booksellers who opened shops after the Civil War in the area that is now the Financial District. The stores clustered around Nassau, Pine, and Ann Streets and along lower Broadway. They also sold newspapers and stationery. Over time, some dealers shifted from books to prints. Such was the case with Joseph Sabin, an English immigrant who arrived in 1848. He became a widely recognized expert in rare books and prints. Since a few men started gathering old maps and views, over forty years ago, the number of collectors has rapidly increased, and things that could be found in the old shops twenty-five years ago or so for $5 or $10 are now quoted in the hundreds. Today, the prints march on. I.N. Phelps Stokes stands behind his wife Edith. *The Pennsylvania Historical Society and the Chicago Historical Society, among historical organizations in American cities, also acquired print collections that tended to be localized. "Isaac Newton Phelps-Stokes" That name alone is worth the price of admission.